The Spotted Tongue: Where did THAT dog come from? So after my post yesterday about Dahlia's showing hesitance in class, of showing a lot of signs of being controlled, she decided to prove me wrong by being an absolute maniac last night. And I don't mean that in a bad way. Quite the contrary, I was thrilled with her all through class last night. She was really amped up, to the point at which in between doing things I kept working with her because she wouldn't settle down. We played a game of tug that was so intense that she was leaping for the toy when she lost her grip on it and once she actually leapt for it, bounced off my chest with her front feet. and snagged it mid-air. Mid-air. This is not a dog who does this sort of thing. Even her games of tug are usually sedate. Last night she went over jumps with speed I've never seen out of her. She was focused and fast. 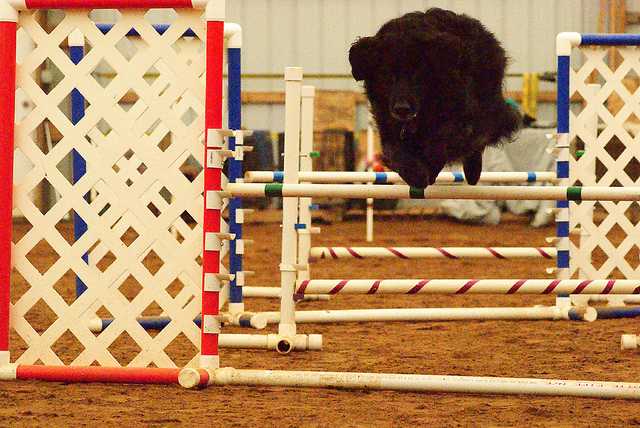 She looked like a real agility dog. We began learning contacts and I severely underestimated her new confidence level. She leapt up on the dog walk (which was only a couple feet above the ground). She actually leapt up and put all four feet on a plank that was only a foot wide. Without hesitation. She turned around on it too. Once she slipped off and it didn't even faze her. She got right back on. And to really top it off, she did a little bit of teeter work, just to get used to the noise of its banging against the ground and it didn't faze my super sound sensitive dog. She reacted, yes, but she recovered quickly. She even took off and got the zoomies during this. This is not a dog who acts like this. But it's a dog who I'd like to see some more of! It sounds like Dahlia read your post whilst you weren't at the computer, and decided to prove you wrong! :) Hopefully this will set a general precedent for your future agility classes with her. For real guys. We joke about her getting on the "dognet" and being able to understand English but I swear sometimes she does! Every time I say "My dog will NEVER be able to do XYZ" she totally goes and proves me wrong.